We would like to thank everyone who sent in their product reviews, and for allowing us to share them with readers. You are helping us reach our goal of informing consumers when the store brand (generic) is just as good as the name brand and when it is not. The following store brand products were found to not be the same as the name brand they are trying to imitate. Our Brandefy Review Club members shared what they liked about both the name brand and store brand, but we found the differences enough to put these items on the "Naughty List." We have some exfoliation-loving reviewers, and these scrubs did not measure up to their counterparts. We had two separate reviews on St. Ives Apricot Scrub, with similar findings. The first one compared St. Ives Blemish Control Scrub vs. CVS beauty 360 Acne Control Apricot Facial Scrub. The difference here is that the generic brand's exfoliating beads are smaller than the St. Ives scrubbing beads. If you are looking for a less aggressive scrub, you may prefer the CVS version, but we are rating based on similarity. Additionally, the CVS version is lighter in color than the St. Ives. Our reviewer said her skin felt equally smooth after both washes. For exfoliation purposes alone, we would stick to the name brand here. 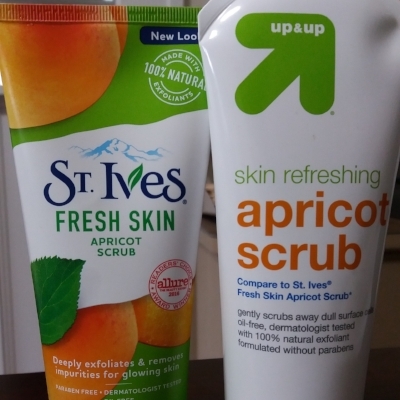 The other St. Ives scrub was the Fresh Skin Apricot Scrub compared to the up&up Skin Refreshing Apricot Scrub. The St. Ives version was found to be thicker with more exfoliating beads. Again, if you prefer more intense exfoliation, you will want to stick with the St. Ives on this one. We had another scrub sent in, this time for Clean & Clear Morning Burst Facial Cleanser vs. up&up Invigorating Facial Cleanser. The reviewer said that the Clean & Clear version had more of a "wake-up factor" with the beads doing a better job cooling the face. Additionally the reviewer preferred the smell of the Clean & Clear face wash more. After you scrub and exfoliate, you may want to use some sun-less tanner to keep your color up this winter. The final review compared Jergens Natural Glow Daily Moisturizer to the equate Lovely Glow Daily Moisturizer. The reviewer put the Jergens on one leg and the equate on the other, and monitored over time. While she did prefer the equate smell because it was not as strong as the Jergens, the Jergens had better effects. We think you will prefer the tanning effects of the Jergens moisturizer.